Where do ideas come from? Where can interesting source material be found? What is inspiration and how can it be developed? How can you sustain interest in your work from source material to finished piece? How do you tread your own authentic and unique creative path? What can you add to the world of creativity that is a definition of you? Who are you as an artist, and where are you going? These are just some of the questions that are answered in Cas Holmes new book Stitch Stories. It is a book full of headings, sub-headings, lists of intent, ideas, prompts, and helping hands. Each segment of the book goes into great detail on its particular method, expanding to incorporate a wealth of tried and tested, as well as novel ideas, in how to approach a level of uniqueness that is the role of the artist in us all. 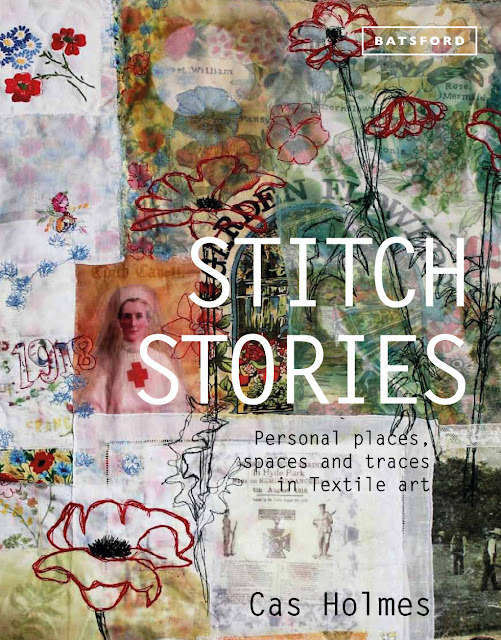 Stitch Stories is aimed at a textile and mixed media audience and is therefore geared towards artists who work, or intend to work, in those fields. The book is full of rich colour photos of Cas own work, as well as the inspiring work of many other artists as well. There are full colour photos of completed works, as well as many works in progress, and most importantly photos of sketch books, one of the areas of work in progress that so many either get stuck on, or are unclear as to what they should contain. To run through the different chapters of the book in order, will probably give you a good inkling as to why this book is such a valuable addition to the artist. It is often a difficult task looking for rich and useful inspirational starting points in which to pursue a series of work, the journey that those inspirational points should take in order to produce work that is both a reflection of those starting points, as well as being an important part of who you are as both an individual, is perhaps the hardest of all. Places, Spaces, and Traces - deals with the recording of your experiences, your observations, your feelings of the world that you observe around you. This segment deals with creating a journal, sketchbook, or other form of recording, such as photography. Collecting information is always the starting point of any form of creative development, and choosing what appeals to you personally is a large part of whether your work will develop or not. Seizing Inspiration - explores a range of potentials for inspiration and exploration, and includes such ideas as using memory and history as reference points, using drawing and simple collage as valuable exercises in focused or unfocused inspiration, allowing the mind to wander, allowing it to draw inspiration from a line, a colour, a texture, all vital elements in the creative journey. The Natural World - gives a number of starting points, with the idea of nature being their source. Nature is all around and within us, so it is equally relevant and a ready source of inspiration, whether you live in a rural or urban environment. Studying and observing the natural world, whether it be in a woodland, or a backyard, is connecting with that natural world. It can be observing, identifying, and recording the differing elements to be found in a canopy of trees, reeds along a riverbank, or indeed tough weeds growing out of an urban wall, all are relevant and all have value to the environment as they do to the artist. Cas also makes it clear how important the cycle of seasons is to anyone interested in using the natural world as a source of inspiration. To observe the same environment through the change in seasons is to understand the layers of change and meaning that can be found within that framework. All in the Detail - deals with the details that are so much a part of any piece of artwork, those details often come from source material themselves, or indeed from the ambience in which those materials are found. The world is a complexity of meaning, and we are part of that complexity. Cas gives us a range of artists work that deals in those details of intricacy that they find in inspirational source material, and that they then project out through their work. Off the Beaten Track - looks at the artist and their responses, through work, of personal themes and interests, rather than generic. A number of artists show their self-expression through an interest in personal family history, social history, comments on historical or contemporary society. Cas gives us a range of artists who have used textiles, both specifically and generally to make a point. Telling Stories - the last segment continues from the previous, but gives examples of how you can tell your own story, how you can express what you need and want to say, through a range of helpful examples and that is what it is all about, giving you a range of tools in order to effectively express yourself. It is so important that self-expression be encouraged. Your own story, your own viewpoint, your own perspective on the world, is a constantly unique one. There may well be seven billion people on the planet, but there is only ever one of you. Cas is fully aware of this and has spent a large proportion of her art career guiding and encouraging others to express themselves through creative paths that only belong to them. If you have the tools and you have the vocabulary then how you use them is up to you. This book is not a book that wants to show you how to work like Cas, how to produce work that copies where Cas has been and where she is going artistically and creatively, it is a book that shows you how to work like yourself, to find your own centre, your own creative strength, to be able to express yourself as your own true self, and not like another, and for that reason, amongst many, I highly recommend Stitch Stories.